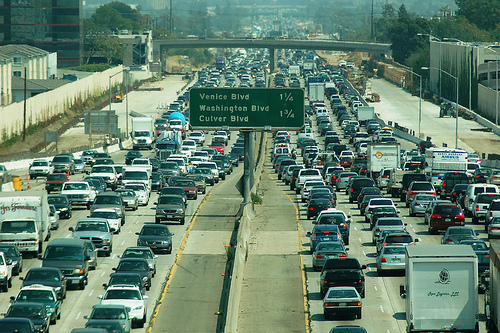 Carmageddon: What are L.A. Musicians Doing to Stay Away from Traffic? Unless you have no choice, I really hope none of you are choosing to drive anywhere in Los Angeles this fearful weekend as Carmageddon strikes. The 405 freeway will be closed on Friday, July 15 at 7 p.m. through Monday, July 18 at 6 a.m. We asked a few of our favorite L.A. musicians what their plans were during the closure. Check out what they had to say below! I can usually astral project my essence to my local cafe. So I am virtually set. But if that doesn’t prove effective, I have self-euthanasia happy meals for me and the family. I’m going to avoid all freeways and catch up on “Real Housewives” episodes. Just kidding, I’ve seen them all. Also, did you hear that Jet Blue is offering flights from Burbank to LAX for $4? I think I might just do it to do it! My plans are to do as I usually do: bike. I think we will also ration supplies and lock ourselves in the “eagles nest.” We have all that we need here. It’s the most magical place on earth. We also may just stay in San Francisco. Break out to Alaska and go ice fishing. This entry was posted in Features and tagged Busdriver, Carmageddon, Fool's Gold, hanni el khatib, l.a., la, los angeles, musicians, superhumanoids, white arrows on July 14, 2011 by Sandra Burciaga Olinger.